This is going to be one of my fave fried rice to do at home. I found this recipe on my fave place Pinterest. I'm always craving for that Korean flavor of the Gochujang paste. This was really spicy and so satisfying. Hope you will enjoy it as well. 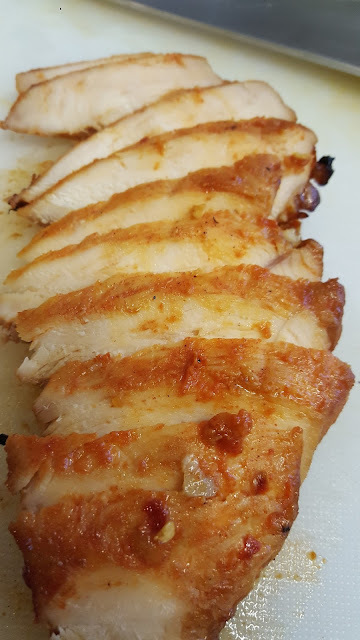 You can find the recipe for this Korean BBQ Chicken from a previous blog by clicking on the picture. 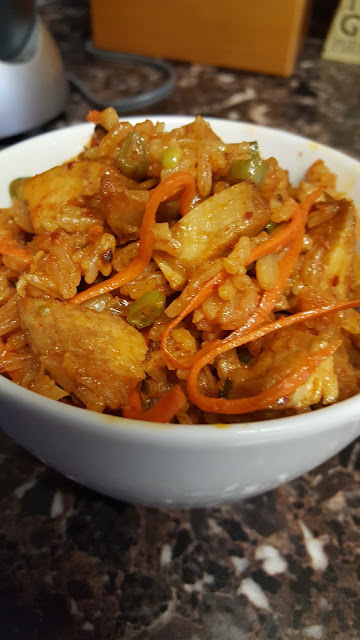 I love Kimchi and it's unique flavor. 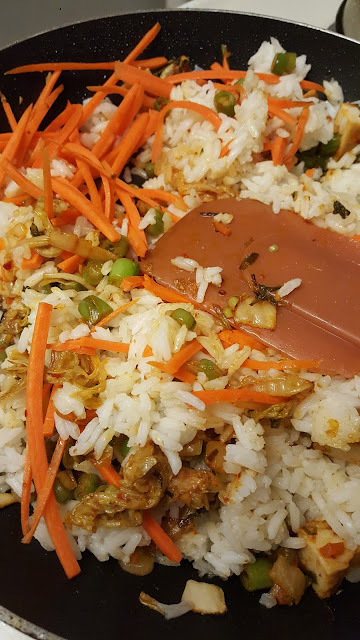 I'm so happy to know I can use it for fried rice as well! 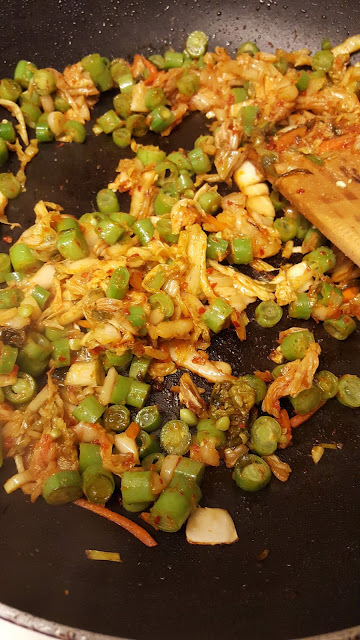 Saute the Kimchi until golden brown, then add the sliced green beans. I've also did it a different way. I left the greens beans out to saute separately in Hoison sauce and garlic. (Yes, I know it's mixing to different cultures, but that's the great thing about food, it allows you to be creative.) Very flavorful. Add the Korean BBQ Chicken to heat up. Next you can add the raw carrots for a crunch and pre-cooked Jasmine rice. 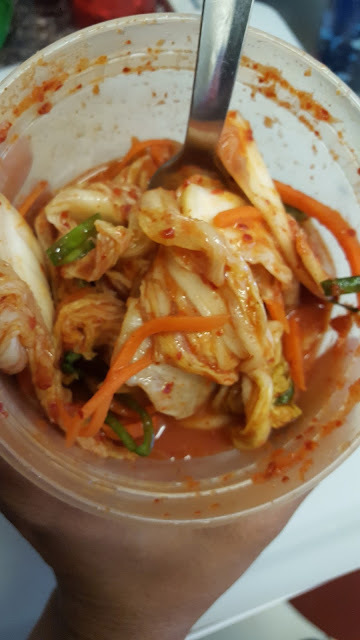 Then you will drizzle in the Kimchi juice mixture. This will give the rice it's color. Serve with a fried egg. I did the mistake of doing an over easy egg instead of a sunny side up egg. But it was still delicious. I also served it without the egg in a small bowl. This is when I made it with the green beans on the side. Squeeze the Kimchi saving the juice in a separate container. 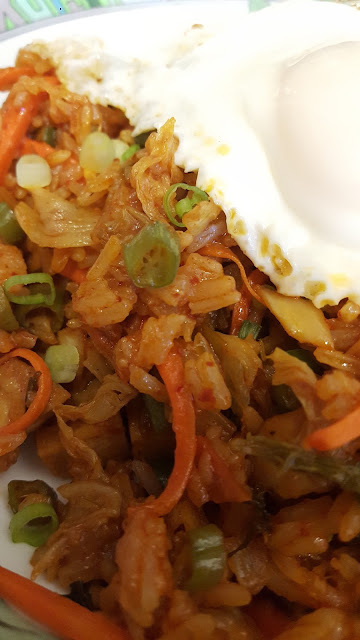 Whisk the Kimchi juice with Gochujang paste and soy sauce. 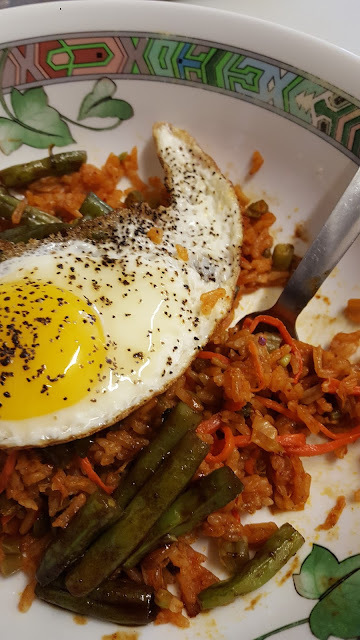 Completely disslove the Gochujang. 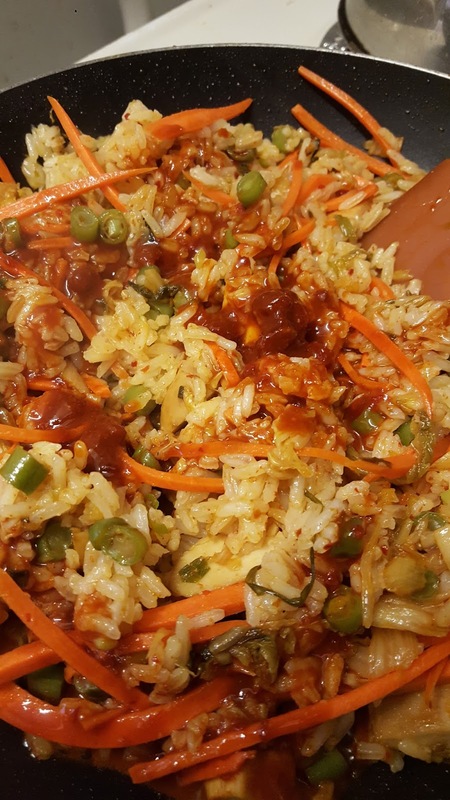 Drizzle sesame oil on the rice to help break up the clumps. Broil or grill the Korean BBQ Chicken as directed in recipe given. When cooked rest for 5 minutes before cutting into cubes. Saute Kimchi with oil until golden brown. Add chicken and green beans (again...you can skip adding the green beans if you wish to serve on the side) and saute until the chicken and green beans are heated. 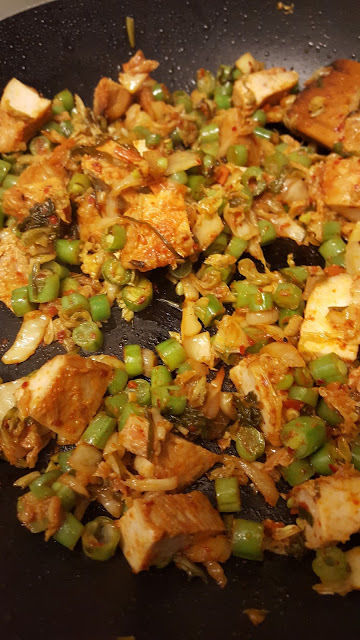 Pour Kimchi juice mix and stirfry. (What I did was flatten the rice mixture and allow it to brown, then mix, flatten again and let it brown). Garnish with green scallions and the sunny side up egg. (And the green beans if you served it on the side).